You’ve heard the old adage “There are two sides to every story.” Well, when it comes to solving complex problems, there are often more than two sides to the issue and even more than one possible solution. So how can teams see the whole picture? This is the challenge facing many organizations today. With an increasingly global and remote workforce, sharing knowledge and creating consensus on any issue can seem like an impossible task. Dialogue mapping is one way that teams can bridge these gaps (in distance, knowledge, and understanding). Here’s how. Dialogue mapping is a facilitation technique used to visualize critical thinking as a group. Created in the 1990s by Jeff Conklin, the method became a popular problem-solving tool for project managers and product developers (as well as other organizational leaders and groups). Take a look below for an example of dialogue mapping (and click to open an editable version in Lucidchart). Dialogue mapping gives teams and individuals the tools to understand complex problems and the unique ways each person approaches possible solutions. Here are just a few of the ways dialogue maps can benefit your organization. Through dialogue mapping, you can keep the team from rehashing the same topics repeatedly while also giving them an opportunity to add new insights to topics addressed earlier should they arise. These documents also make it easier for team members to get up to speed quickly if they missed a meeting. By visually mapping the discussion, stakeholders can see which topics or issues need further discussion or consideration. This process allows the team to prioritize their time and focus their attention more effectively. The beauty of dialogue mapping is that only the facilitator needs to have any technical training in the mapping and notational process. Everyone else can simply participate by sharing their thoughts and ideas within the group discussion. Plus, while the facilitator may be trained to map the dialogue, the IBIS notation is easy to understand visually, so stakeholders can quickly interpret the discussion and get up to speed. 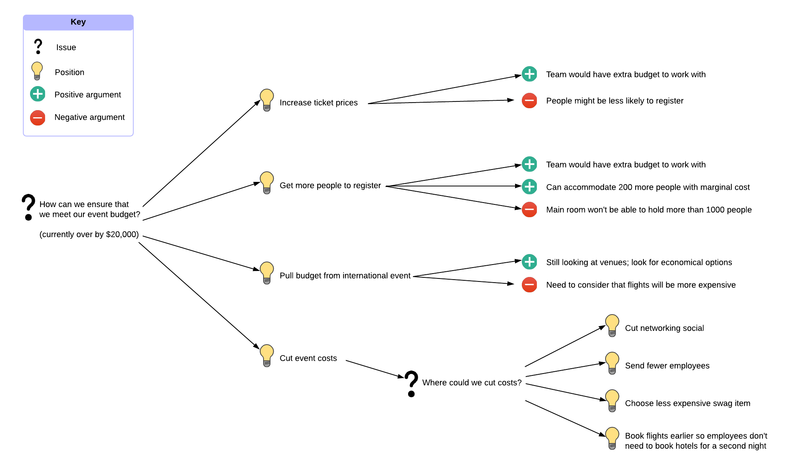 A dialogue map visualizes the group’s thinking and reasoning on an issue, making it easy for stakeholders to quickly identify and understand why and how a decision was made. Because dialogue mapping is a comprehensive and collaborative decision-making process, the final result is a solution that each stakeholder contributed to and deeply understands. This level of collaboration is especially important for initiatives that require multi-level buy-in and adoption in an organization. As such, dialogue mapping can be a powerful tool for building a resilient and agile organization that is better prepared to adapt to changes and challenges in the future. The decision-making process can quickly get bogged down when tackling complex or “wicked” problems. Dialogue maps help teams and organizations collaborate and deliberate on complicated issues more effectively by facilitating a discussion that breaks down each issue and idea. 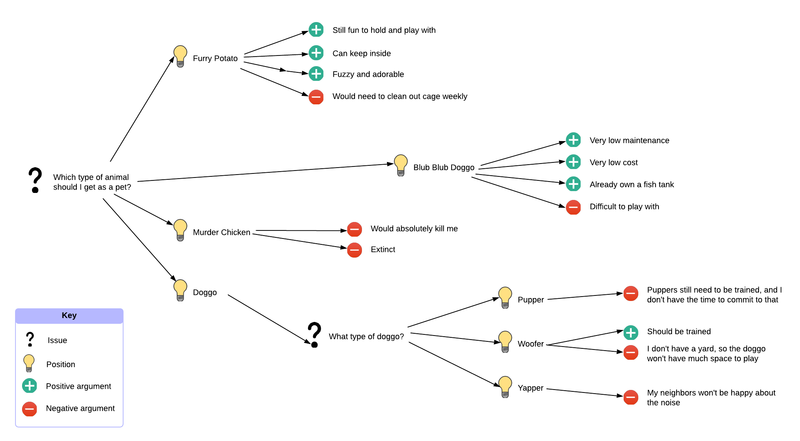 In other words, dialogue maps visualize the critical thinking process, making it easier to consider problems from every angle. What is a “wicked problem”? First coined by Horst Rittel and Melvin M. Webber in 1973, “wicked problems” describe problems that are hard to define and difficult to solve. Though the term originally applied to social and cultural issues, it has also been adopted in product development and other business disciplines. There is no definitive end or stopping point. Solutions are good or bad, rather than true or false. There is no formula for solving a wicked problem. Wicked problems are symptoms of other problems. There are no alternative solutions. There are multiple explanations for a problem depending on individual perspectives. In short: Wicked problems are complex issues that don’t have one clear-cut solution. For project managers and development teams, these issues make it difficult to design and plan solutions with confidence and consensus. That’s where dialogue mapping comes in. Dialogue mapping gives diverse teams and groups of stakeholders a system to understand complex problems and visualize their many possible solutions. P.S. If you don't know some of the terms used in this document, make sure to check out our "Lucidchart Explains the Internet" videos! First, gather together your team of problem-solvers, which usually includes a diverse group of individuals, often from different teams or departments (e.g., development, marketing, management, etc.). By gathering a group of diverse contributors, you can ensure the dialogue (and resulting knowledge) is comprehensive and reflective of the varied perspectives within your organization. The facilitator (or mapper) guides the group discussion and is responsible for interpreting each individual's ideas and translating them clearly to the shared diagram. The facilitator must be an active listener and good communicator. During the mapping process, the facilitator listens to each team member’s thoughts, writes the ideas on the diagram and then validates the information, confirming that the ideas were correctly understood and clearly expressed. Dialogue mapping uses the diagram language IBIS (Issue-Based Information System) to notate ideas. IBIS notation has three elements: issues, ideas, and arguments. Issues are the problems or questions being discussed. On the diagram, these are typically framed as questions (e.g., “What should we do about X”). Issues can be independent or connected to another issue, position, or argument. This allows the team to question and consider every element, giving the group a more comprehensive picture of the main problem. Ideas (or positions) are the responses and proposed solutions to the issue(s). Within IBIS notation, ideas can only respond to issues. This is typically notated with an arrow directed from the idea node to the issue node. Arguments are either for or against an idea (i.e., pros or cons). Arguments are key to mapping out a full analysis with perspectives from different backgrounds. On the map, arguments are only connected to ideas, describing the group’s multiple viewpoints on each idea. Dialogue mapping relies on good diagramming tools and displays to be effective. Not only must the diagram be easy to document, but it must also be easy to share among a diverse group of contributors. The ability to share your dialogue map is particularly important if teams are collaborating remotely (sometimes across time zones or continents). Lucidchart helps teams and organizations stay on the same page throughout the entire dialogue mapping process. It’s a cloud-based diagramming platform that makes it easy for multiple contributors to collaborate and share ideas in real time—no matter where they’re working from. Plus, Lucidchart comes equipped with a vast shape library and ready-to-use templates so you can customize your diagrams and start mapping your dialogues right away. Whether you’re a product manager, CEO, or developer, sharing knowledge and visualizing problems (and their solutions) has never been easier.